If you’re a Republican consultant, this chart is a threat to your livelihood, because it indicates a future without the Republican Party (at least on a national level). This is just basic math. First off, millennials are the largest generation in history. According to Census.gov, as of 2016, there were 31 million women aged 20 to 34 in the United States. A new Pew poll indicates that 21.7 million of those women identify as Democrats. To put that figure in context, all women broke for Barack Obama by 11% in 2012. Millennial women now favor the Democrats over the GOP by 47%. Compare that to other groups, and the stark difference really comes into view. Making matters worse for the GOP, that poll samples registered voters. The story behind this can essentially be told in two of these charts: Democratic identification amongst the Silent Generation (those born between the 1920s and 1940s) plummeted in 2008, and millennial women more than made up that gap beginning around 2014. One was a racist backlash and the other sure looks like a backlash to the racist backlash. If you’re looking for a rationale behind the incoming Democratic wave, millennial women rebuking generations of politics seems to be the most likely cause. There were 98 state special elections last year. Democrats held 45 seats to the GOP’s 53 before voters hit the polls. After? Fourteen seats flipped from R to D (compared to just three going D to R), and the composition of these seats is now 56 for the Democrats versus just 42 for the Republicans. This trend has continued into 2018. A total of 28 seats have been contested as of this writing. The GOP dominated these posts, 23 to 5 coming into the year, but now have 17 seats versus 11 for the Democrats. Some of the swings from 2016 elections have been downright staggering. Wisconsin Republican Governor Scott Walker called the 26 point move towards Democrats in Wisconsin Senate District 10 a “wake up call” for the GOP. The 49th Legislative District in Kentucky flipped 86 points from 2016 after the Republican candidate killed himself after being exposed for sexually abusing a 17-year-old girl, and his wife lost to Democrat Linda Belcher. One of the eternal problems not just in the United States, but with democracy, is the absence of young people at the polls. According to Census data, on average, just 49% of citizens aged 18 to 34 voted in presidential elections since 2000. The situation is even more dire in midterm elections, as that number plummets to 26%. However, there is some hope that may be changing. This blue wave isn’t just taking place at the ballot box, but on the ballot itself. This chart demonstrates the astounding number of Democrats challenging House races across the country. This all comes on the heels of the Women’s March the day after Trump entered office, and the various protests that have emanated from what was effectively a counter-inauguration. 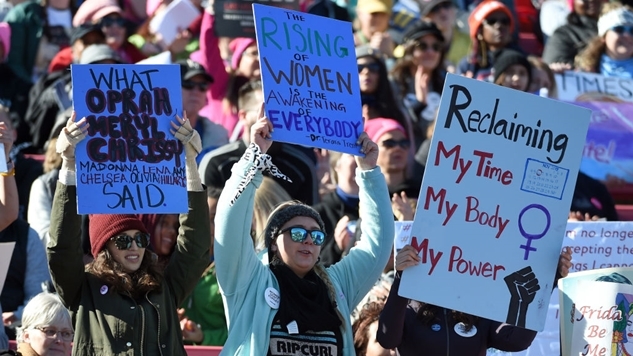 There is plenty of hard evidence proving that women are leading the charge against the Republican Party—like the 13,000 women planning to run for office. This latest poll from Pew indicates that this wave skews younger, and if these special elections are harbingers of things to come, millennial women will be running practically every legislature in America sooner rather than later.